There were a total of 181 runners in Flight 1A and a total of 161 in Flight 1B. That means a grand total of 342 and a prize pool of $86,252. Kevin Calenzo and Matthew Wantman agreed to another head-up chop. Calenzo would take $71.943, and Wantman would take $58,000. After agreeing to run out a series of hands to determine the winner of the trophy, Kevin Calenzo came out victorious after five hands of play. Anthony Vitone shoved all in on the button and Matthew Wantman called. 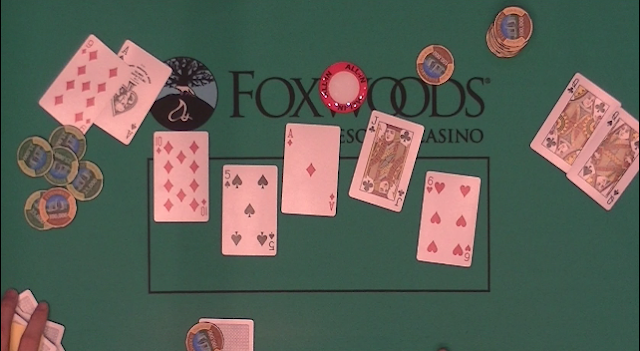 The flop came [10c][7s][6s] leaving Wantman in the lead. The [qc] on the turn gave Wantman a set, but also gave Vitone four straight outs. The [ad] on the river was not one of those outs however, and Vitone would would be eliminated in 3rd place. Je Wook Oh shoved all in from the small blind for 950,000 and Anthony Vitone said, "I'll give it to ya. I call." The board ran out [7s][ad][6s][qs][9h] to eliminate Oh in 4th place. Matthew Wantman raised to 500,000, Anthony Vitone reraised to 925,000 on the button, and Wantman shoved. Vitone asked for a count but before hearing the total announced that he called. The board ran out [10h][6s][5h][4h][jd] awarding Wantman a full double up. The dealer counted out the chips and determined that Vitone would have to transfer 4,675,000 of his chips to Wantman. Vitone said, "If I had known you had that much I wouldn't have called. " Wantman is now sitting with nearly 10,000,000 in chips. Joe Hertel raised to 400,000, Anthony Vitone called on the button, and Matthew Wantman shoved all in from the big bling. Hertel called and Vitone folded. The flop came [kh][qh][3h] and a player not involved in the hand said, "Action flop." Hertel maintained his lead when the turn came the [qs]. 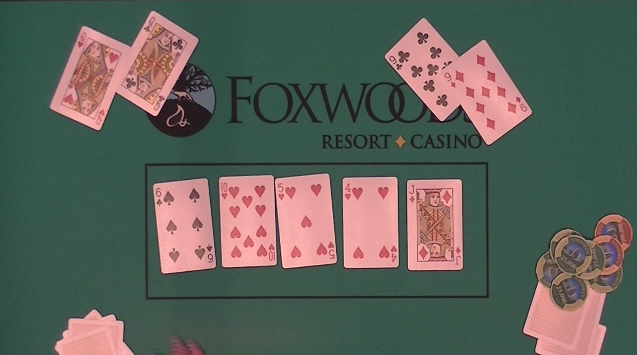 The river came the [2h], and Wantman would win the hand with his heart flush. After a close count of chips it was determined that Wantman had Hertel covered, and Hertel would be eliminated in 5th place. They will play it out for the remaining $20,000 and the trophy. Please check out www.foxwoodslive.com for the live stream with audio. The players at the final table have decided to take a break to discuss a potential chop deal. Further details will be provided as soon as they are available. Joe Hertel raised to 400,000 on the button and Anthony Vitone shoved all in from the small blind for an additional 1,625,000. Joe Hertel said, "I am feeling lucky," and called turning over [jh][8d]. Vitone tabled [as][10c]. The board ran out [ac][jd][3s][9h][9d] awarding Vitone a full double up. Anthony Vitone shoved all in. It folded around to Joe Hertel in the big blind who went into the tank. Hertel checked his cards numerous times and eventually asked Vitone if he wanted a call. "You can call, you can fold, I'll show you one. It's up to you boss. I don't like to give advice." "You'll show me one," Hertel asked. Joe Hertel then folded his hand. Vitone turned over [ac][7c] and Hertel said, "Man, I had you crushed with ace-nine." Kevin Calenzo opened to 450,000. Joe Hertel shoved all in from the big blind, and Calenzo called. The board ran out [ad][10d][5s][jc][6h] awarding Hertel a full double up. The live stream issues appear to be resolved at this time. The lagging and timing out appear to be much better now. So please check out www.foxwoodslive.com for coverage of Event #1 Final Table streaming live now. Event #1 final table are just heading to a 60 minute dinner break. Five players remain, and we are streaming live at www.foxwoodslive.com. Event #5, Flight 1A is in the midst of playing the last level of the night (Level 15 1,200/2,400 blinds with 400 ante). There are currently 44 players remaining. Event #5, Flight 1B is in the midst of playing Level 5 (100/200 blinds). There are currently 115 runners still in, and registration is open until the start of Level 8. For anyone viewing the live stream (on www.foxwoodslive.com) of Event #1 final table, please note that we are currently experiencing technical difficulties. We are working to get them fixed and you should see an improvement shortly after we work with the IT department to increase our Internet speed. Thank you all for your patience. We will send out another message when issues have been resolved. Je Wook Oh raised to 325,000 on the button. Joe Hertel called in the small blind, and Peter Wagner shoved all in for 1,435,000 in the big blind. Oh called and Hertel folded. Wagner was in good shape when the flop fell [as][qh][6h] as he paired his ace. When the [kd] came on the turn Oh said, "Yes," after hitting his straight. "You've got to be kidding me," said Wagner. The [2d] on the river was of no help, and Wagner was eliminated in 6th place. The players in event #5 ($300 NLH Multi Flight Event) are now on break. There were a total of 181 runners, and at the present moment there are 63 remaining. They will be coming back to Level 13 (800/1,600 blinds with a 200 ante). This flight will play down to either 21 players or to the end of Level 15, whichever comes first. The players making it through will combine with Flight 1B players tomorrow (Thurs. Oct. 8th) at noon for Day 2. Flight 1B is now underway and there are currently 56 players registered in Level 1 (blinds 25/50). Players will have until the start of Level 8 to register and re-enter for this event. Tomorrow (Oct. 8th), the players from both flights A and B will combine and play Day 2 at noon. As a reminder this event has a $50,000 guarantee. Vinny Pahuja is all in and has been called by Joe Hertel. 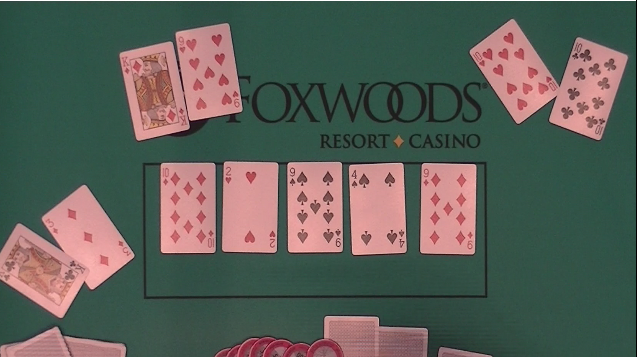 The flop came [9s][9d][8s] giving Hertel the lead with his two pair. The [4s] turn and [9h] river gave Hertel the bigger full house, and Pahuja was sent home in 7th place. After the flop came [8d][3c][4c], Vinny Pahuja shoved all in and was called by Charles Saleba. Seleba was ahead until the turn brought the [as], giving Pahuja a pair of aces. The [js] river did not help Saleba and he was sent home in 8th place. Je Wook Oh completed in the small blind and Joe Hertel raised to 230,000 in the big blind. Oh called. Both players checked the [qd][9h][9s] flop and the [4h] turn. Hertel checked the [2c] river and Oh bet 435,000. Hertel called. Oh turned over [4d][4s], having turned a full house. Oh is now sitting with just over 2,000,000 in chips. Dan Guzman raised to 250,000, Kevin Calenzo three-bet to 575,000, Guzman shoved all in, and Calenzo called. 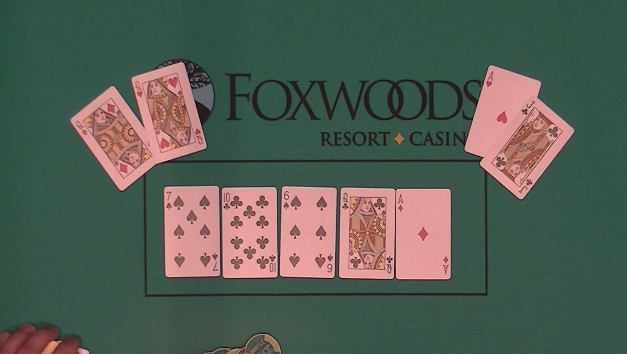 Guzman was ahead holding [js][jc] against Calenzo's [as][qc] when the flop came [kh][4c][2d]. But when the [ac] fell o the turn Guzman sighed heavily. The [8s] on the river did not improve Guzman's hand and he was eliminated in 9th place. There are currently 125 players remaining of the 160 that started in Flight 1A of Event 5 - $300 NLH MULTI FLIGHT EVENT (With Re-Entries) $50,000 Guaranteed. They are playing Level 6 right now. 200/400 blind with a 50 ante. Kevin Calenzo made it 125,000 from the hijack. Je Wook Oh and Dan Guzman called in the blinds. The flop came [kd][10d][5d]. Both blinds checked, Calenzo bet 175,000, and only Oh called. Both players checked the [3c] turn. Calenzo checked when the river came the [9c] and Oh bet 285,000. Calenzo tanked for a few moments and opted to fold his hand. Oh turned over [5c][5h] for a flopped set. "I had the [ad]," said Zalenzo. "I know. I was hoping for the [3d] on the river," Oh replied. Donald Lohr shoved all in from under the gun. Action folded around to Charles Saleba on the button who reshoved over the top of Lohr. The board ran out [10c][7h][5h][7c][6s] eliminating Lohr in 10th place. Players have just done a redraw for seats and have gone on a ten minute break. We will bring you a list of players, seats, and chip counts as soon as possible. Sorin Ciobanu shoved all in with [9h][9d] and was called by Kevin Calenzo holding [10s][10d]. The board ran out [7s][4s][3h][qc][qd] eliminating Ciobanu in 11th place, just shy of the final table. Jared Mahoney shoved all in with [as][10h] and was called by Dan Guzman holding [jc][jh]. Mahoney made a pair of tens when the flop came [10c][6c][5h]. But the [4c] turn and [qd] river did not improve his hand, and Guzman's pair of jacks would win the hand, eliminating Mahoney in 12th place with a $7,429 payday. 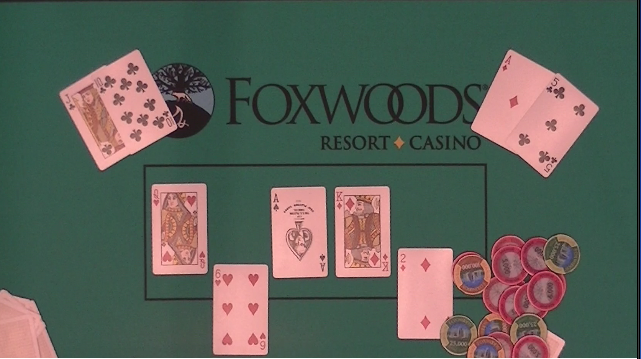 There was a three way all in preflop between Sean Haley, Jonathan Lewis, and Matthew Wantman. 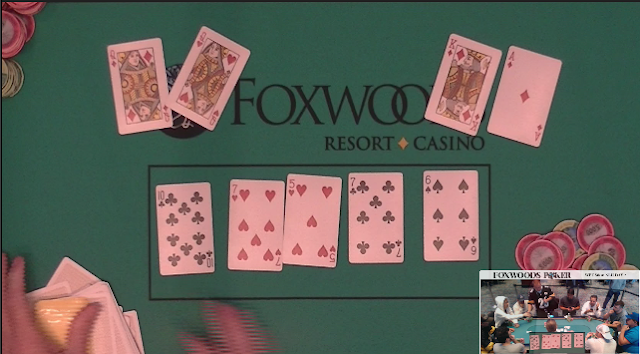 The flop came [10d][2h][9s] giving Wantman the commanding lead. 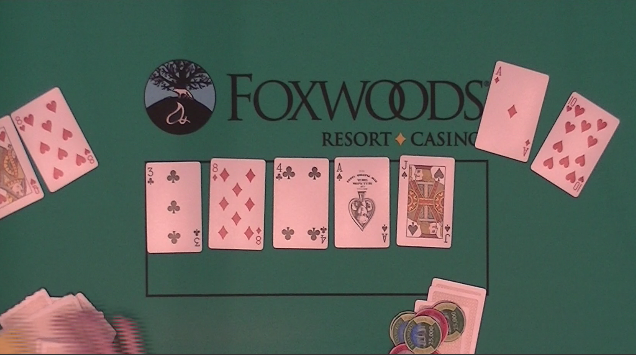 And while the [4s] turn and [9d] river gave Haley trip nines, it also gave Wantman the winning hand with his full house. Lewis would be eliminated in 14th and Haley would become the 13th place finisher. Cards are in the air for the third and final day of Event #1 $600 NLH. 15 players remain. 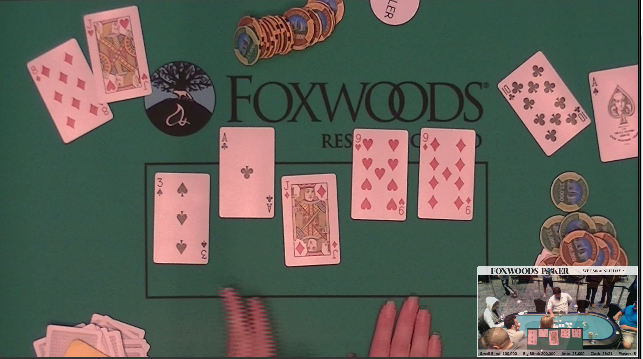 Watch our feature table at www.FoxwoodsLive.com to follow all of the action. Fifteen players will return tomorrow at noon for the conclusion of this event. The clock has been paused with ten minutes left in the level and the floor has determined that four more hands will be played tonight before bag and tag. After the conclusion of the four hands the players will bag their chips and return tomorrow (Wed.) at noon for the conclusion of this event. Stay tuned here at www.foxwoodspoker.com for live updates and watch our live stream of the feature/final table tomorrow at www.foxwoodslive.com.